Both are sure taking it easy. Aw, such cute snuggle buds. Does this mean Murray is feeling a little better about the new boy in the family (and all the changes)? I saw your tweet about him peeing in the frying pan. Matteo (my kitten) won’t sleep alone. If he has to, he goes into the bathroom and curls up in the basket I used to make him sleep in as a baby (when he was sick and I had to keep him away from chou). He barely fits anymore. It’s really cute to see him voluntarily curl up in there. 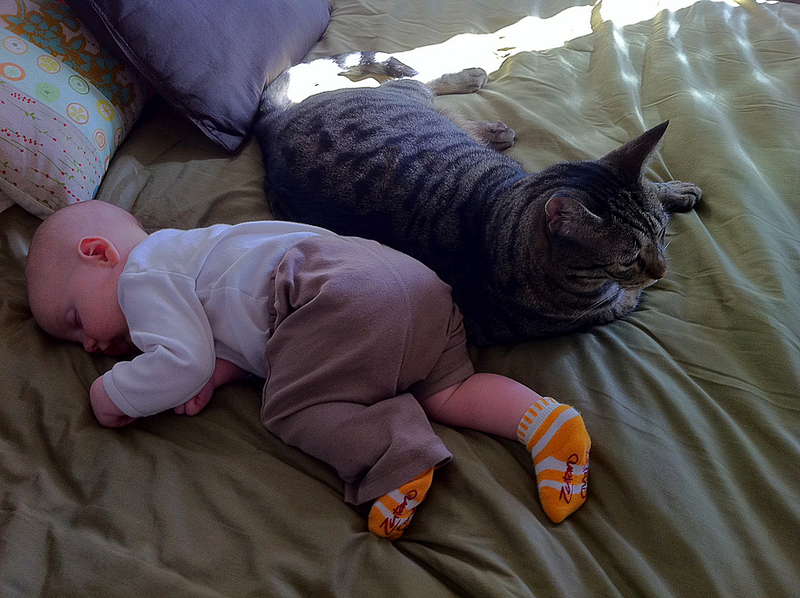 I don’t know what I want to nibble on more: the pudgy little baby legs or the fuzzy cat ears. Tuesdays with Murray will never go out of style. I love how babies sleep. Any which way but loose. I want to take a nap with these two. So cute. Emerson was and is such a tummy sleeper.